Since the early 1940s the classification of plasma lipoproteins has been based on their nonspecific physical properties such as hydrated density, size, and electric charge, and the operationally-defined lipoproteins have been considered to represent the fundamental chemical and metabolic entities of the lipid transport system . 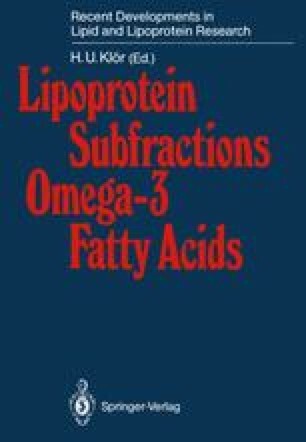 However, more recently accumulated evidence has pointed out that this conceptual approach is untenable, because lipoprotein classes, defined by their physical properties, are both chemically and metabolically heterogeneous [2, 3]. In addition to hydrated density, size, and charge distribution, major operationally-defined lipoprotein classes are also heterogeneous with respect to their lipid/protein and apolipoprotein composition. The occurrence of apolipoproteins in non-equimolar ratios and the immunochemical patterns of non-identity or partial identity between at least some apolipoproteins have provided the crucial evidence that individual lipoprotein particles of the same density class cannot have the same apolipoprotein composition. Moreover, these findings have suggested that the operationally-defined lipoprotein classes consist of several distinct lipoprotein species rather than a single homogeneous lipid/protein complex [2,4,5]. The recently established kinetic heterogeneity of lipoprotein density classes [3, 6] is compatible with the occurrence of distinct lipoprotein particles within the operationally-defined lipoproteins.